Online slot developer Ainsworth already has a bit of history in the genre of Oriental slots after releasing its Dragon Lines slot to a positive reception and it follows up that title release with this second Oriental-themed slot called Grand Dragon. 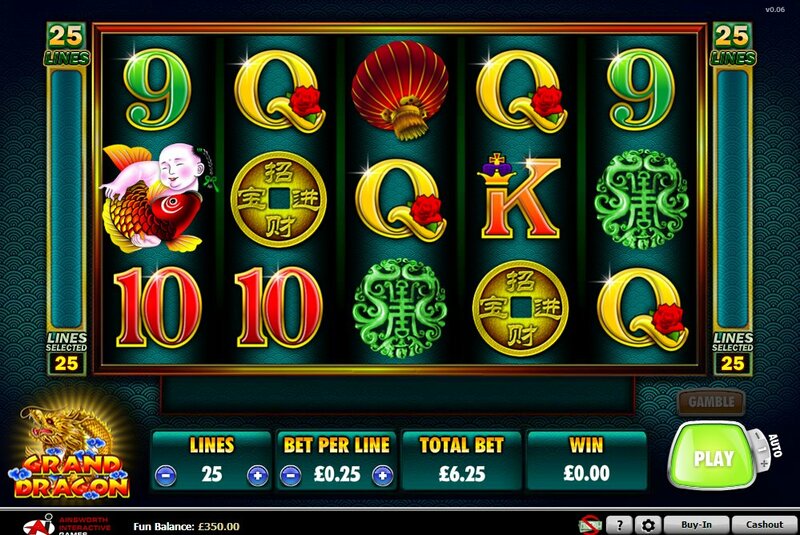 Grand Dragon is a 5 reel, 25 pay-line slot that has all the hallmarks of a classic Oriental-themed slot from the green background of the reels to the symbols used across the reels such as the Ying and Yang symbol, the Chinese lantern, the strange looking symbol of a Chinese man wrestling a Koi carp and jade ornaments as well as the standard 9 through to Ace symbols. All Hail! The Grand Dragon Wild! The dragon symbol in Grand Dragon represents the Wild and it substitutes for all other symbols except for the Scatters in order to complete winning combinations. Considering the name of the slot is Grand Dragon, the dragon symbol can be very grand indeed with some nice payouts coming from the Wilds that complete winning combinations. The Ying and Yang symbol acts as the Scatters and it is these that are the trigger to unlocking the free spins. You must hit three of these symbols across the reels on reels 2, 3 and 4 to trigger 10 free spins. During the free spins bonus round, the regular 25 pay-lines are increased to a staggering 50 pay-lines opening up the possibility of more winning combinations being hit. It is also possible to trigger additional free spins by hitting three Scatters across the reels during the free spins. It should also be noted that during the free spins a new phoenix symbol appears on reels 1 and 5. If you hit this phoenix symbol on reels 1 and 5 at the same time then you will trigger the Phoenix Bonus feature. In this feature, reels 1 and 5 will be full of Expanding Wilds with the middle reel being re-spun once for an opportunity to win some big payouts by completing winning combinations. Grand Dragon does not win any prizes for originality when it comes to the theme but the inclusion of Wilds, free spins and a neat little bonus feature within the free spins shows that the slot does hold some innovative attributes. The slot plays well and I can see it being a big success. Players that love other Oriental-themed slots such as Microgaming’s wonderful Asian Beauty slot and Aristocrat’s exciting 50 Dragons slot will want to play this as soon as possible. 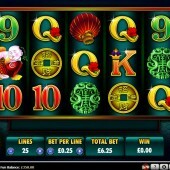 A great little addition to the Ainsworth online slots portfolio.